Businesses expect analytics to describe, diagnose, predict and prescribe. 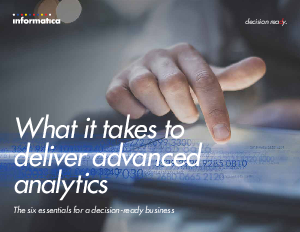 But if your decision makers don’t get answers fast enough to adjust their plans, advanced analytics will have failed to deliver on its promise. The trouble is most companies don’t solve the most fundamental challenges plaguing their analytics projects. What needed is great data that businesses can use to make sound decisions. And the only way to get great data is to treat intelligent data management like a strategic business function.